Since 2001 Flypoet has been widely regarded as the hottest, on-going spoken word venue in the country… some say, in the world! 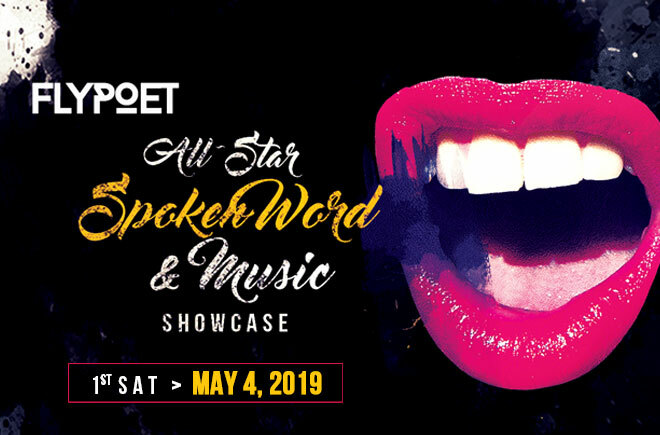 Flypoet presents a fully curated, who’s who of the international spoken word scene. Featured musical guests and our house band "The Flypoet Players" bring the house down to open the night, between poetry sets and sometimes backing the poets. The R&B/Soul vibe of the night is undeniable. Watch in amazement as world renowned performance painter, Norton Wisdom, creates live interpretations of the entire stage presentation on a huge back-lit "canvas". A beautiful urban professional audience, a tightly produced show that starts, runs and ends on-time, cocktails, a bite to eat... and one of the most entertaining as well as culturally and artistically significant events in all of Los Angeles! Tickets for our monthly showcase are cash only at the door. Reserved table and booth seating is available in quantities of 2, 4 or 6 starting at $28/person CLICK HEREfor booking. Tickets for Summer Classic and other special events are detailed on the individual event page.